for Automotive Paint Protection Films, Paint Correction, Ceramic Coatings and Window Tinting in Manchester, Nashua, Andover and throughout the area. "Joe is a true master artist at what he does. To say he is meticulous would be an understatement. I am glad I went to COVER UP SOLUTION." What sets COVER UP SOLUTION apart and what we are most proud of is that we do everything ourselves. We do not sub-contract any work to outside installers. We perform high quality workmanship and take the utmost pride in our customers' satisfaction. "As the new owner of a 2015 Lamborghini Aventador, I immediately began my search for a way to protect my car from chips that inevitably occur during normal driving. I researched a variety of options and requested recommendations from several car enthusiasts. I am pleased to say that choosing Cover Up Solution was an excellent choice. 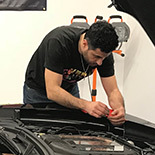 The owner of the company, Joe, personally installed the XPEL paint protection film to my vehicle and the quality of his workmanship exceeded all of my expectations. I have highly recommended this company to many of my friends and family and I intend on having more work done by this highly professional and courteous individual. Conveniently located off Rt. 93 in Salem, New Hampshire. Specializing in Automotive Paint Protection, Paint Correction, Ceramic Coatings and Window Tinting. Contact COVER UP SOLUTION for your next project! ©2018 Cover Up Solution. All Rights Reserved.